do not recommend any car without AC & PS to our prospective buyers. The Alto 800 'LXi' costs 10,400 Rs. per month (EMI 5600 + Petrol 4800). That is identical to Datsun Redi Go ‘T’ costing 10,400 (EMI 5650 + Petrol 4750) and tantalizingly close Kwid ‘RXL’ costing 10,750 per month (EMI 6000 + Petrol 4750). For just 350 Rs. more than the Alto LXi, you get the Kwid ‘RXL’, which is a much more practical vehicle, with more spacious cabin, bigger boot etc. as detailed in our Alto 800 vs Kwid Comparison, which is why we do not recommend the Alto 800 ‘LXi’ Petrol. The Alto 800 'VXi' costs 10,800 Rs. per month (EMI 6000 + Petrol 4800), which is just 550 Rs. or 5% more than the Kwid ‘RXL’ costing 11,350 per month (EMI 6600 + Petrol 4750). Compared to the Alto VXi, you get a 7-inch Touch-screen Navigation unit, more spacious and practical interiors etc. as detailed in our Alto 800 vs Kwid Comparison. That is why we cannot recommend the Alto 800 ‘VXi’ Petrol to our dear readers. 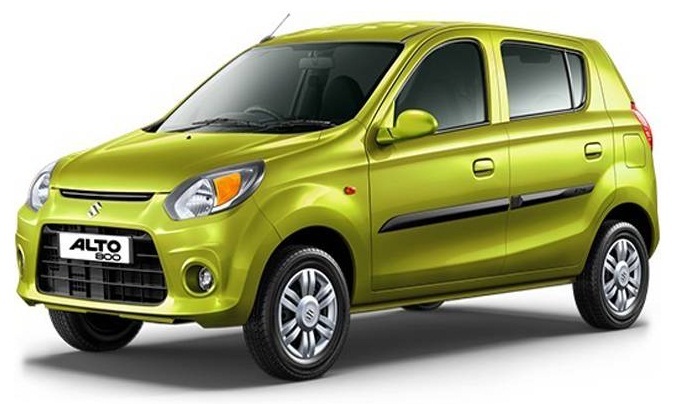 The Alto 800 'LXi' CNG has an EMI of 6700 Rs. requires only 2000 Rs. worth of CNG every month, plus around 650 Rs. worth of Petrol, bringing the total to 9350 Rs. per month. As a family car, it has the added limitations of badly reduced boot-space over petrol cars as well as the long queues and frequent re-fuelling required for a CNG vehicle. For an average person who uses his car for 10,000 to 15,000 kilometers every year, a used car makes more sense. Used i10s, WagonRs, Santros or even Altos make way more sense as a first car compared to the Alto 800 CNG. Firstly because they cost less. Consider the case of an Alto (Petrol). A well, maintained, 40,000 km driven specimen is available for 1.5 Lakh Rs. Considering a 4% higher interest rate than the ‘new’ Alto 800 CNG, its monthly cost works out as 8200 Rs. (EMI = 3000 + Petrol = 5200), which is 1150 Rs. or 13% cheaper than the CNG. If you have intra-city commutes of over 80 kilometers per day, then an Alto CNG will cost you 12,000 Rs. per month (EMI 6700 + CNG 4000 + Petrol 1300), which is 1400 Rs. lower than a used Alto’s 13,400 Rs. per month (EMI 3000 + Petrol 10,400). This is the only scenario, in which we would recommend the Alto 800 ‘LXi/LXi O’ CNG as the best available offering in the Indian car market for you.